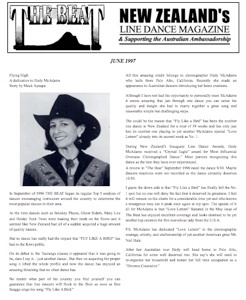 If you like a touch of pizzazz or incredible style with your line dance workshop then you need look no further than the beautiful grace personified by California’s Hedy McAdams. Otherwise why not try relaxing and just be mesmerized by that cute American accent. Hedy visited our New Zealand shores for a brief eventful weekend. Dancers around New Zealand crammed the floors to catch a glimpse of the lady whose name has become a household icon among kiwi bootscooters. She is best remembered for the dance “Fly Like a Bird” which continues to thrill throughout the world. Recently her dances “Shipwrecked” and “Love Letters” tied for first place in the “Crystal Eagle Awards” while the more up tempo beat of “Younger Men” has suddenly made a resurgence. For me it was a chance to meet a lady whose dances have an uncanny element of perfection. However upon being introduced and having a few moments to chat it didn’t take long to acknowledge that the perfection of the dances is a whole-hearted reflection of the choreographer’s personality. Hedy was very impressive. From the moment she took the stage her easy to follow instructing gave dancers the ease required to learn her rather difficult dances. When the steps appeared tough her delicate presence made the going easy. After persistent revision I was happy to have learned her dances thoroughly and thus enjoyed the evening immensely. This was not only my feelings, but those shared by the many Aucklanders who attended her Friday night workshop. Hedy McAdams arrived in New Zealand on Thursday July 23rd after completing a recent tour of the United Kingdom. Hedy is off to cast her magic in Australia, attending Terry Hogan’s CWDI event. But she says her short tour of New Zealand will take many memories for her. In Auckland the dancers treated her to a loud mighty rendition of “Southern Streamline”. In Palmerston North she was thrilled at Janeen Kenny’s “Memory Lane” and in Christchurch, Stephen Paterson showed “Mine Tonight” which touched Hedy’s heart. Another memory she takes is the “Kiwi attitude of being so free with music styles” and she cannot wait to pay a return visit. After her Australian tour Hedy will head home to Palo Alto, California for some well deserved rest. She says she will need to re-organize her household and restart her full time occupation as a Divorce Mediator. All contents of this page © 1999-2012, Cactus Rose Presents and Hedy McAdams and DanceAdventures.com, unless otherwise noted. Artwork and photos are not public domain; contact Hedy McAdams to request permission to reproduce.